So far I've been able to make good use of this Christmas break to get in a lot of riding, on my trip and here at home. 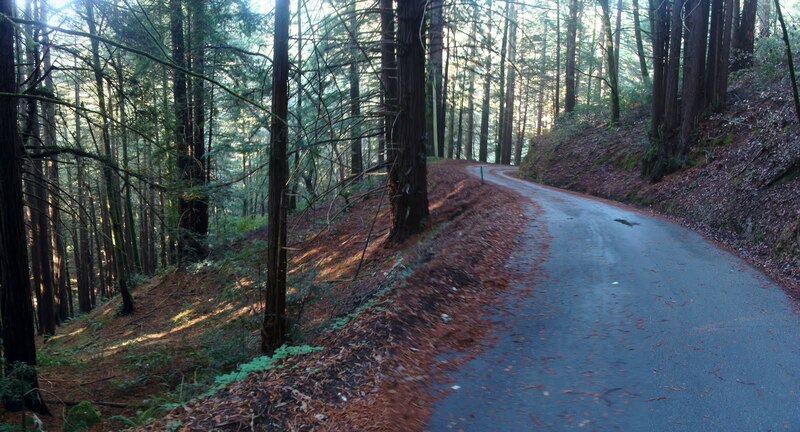 For yesterday's ride, it was time to return to the Santa Cruz mountains, for a few reasons. First, because it's a great place to ride. Second, there won't be any Christmas tree traffic. And third, I could really use a break from the dry and barren rides in the Diablo range and in Phoenix. If my recent rides were in dry conditions, this was certainly a change. Thursday night it rained, and Friday dawned overcast and foggy. It wasn't raining anymore, but the roads were quite wet. The clouds had held the temperature in check, so it wasn't cold when I left the house at about 9. I took my normal route through Los Gatos and around the Lexington Reservoir. 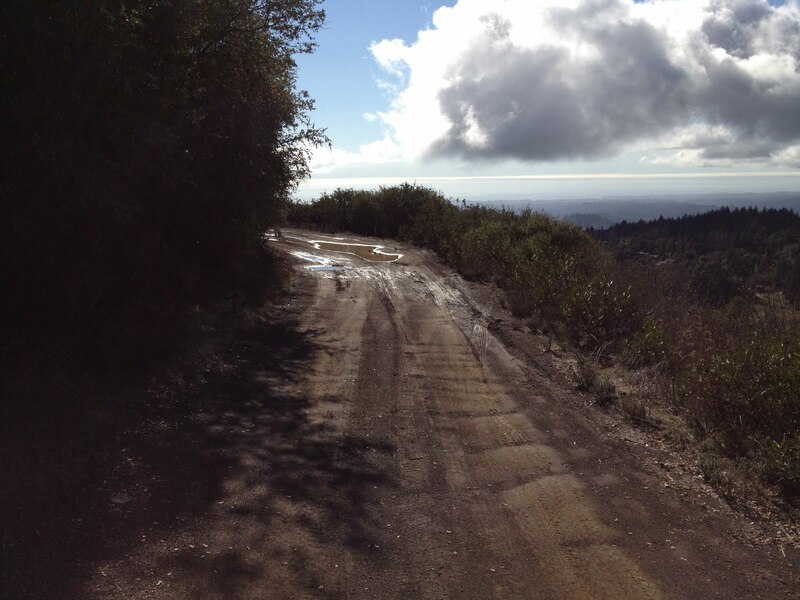 Instead of taking Old Santa Cruz Highway all the way to Summit, however, I instead turned onto Mountain Charlie Road, which I've only previously descended. That's a pretty steep stretch of road, but it's short. 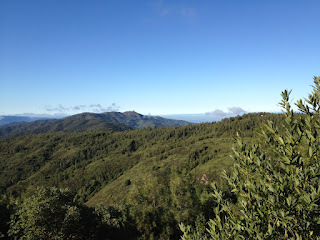 Once I got to Summit I crossed Highway 17 and descended the west side of Mountain Charlie Road, down into Scotts Valley. Mountain Charlie Road is a much better road to climb than to descend, but having said that it wasn't as bad as I expected. In Scotts Valley I took Mt Hermon Road west into Felton, where I stopped at the grocery store for a warm, freshly made sandwich. 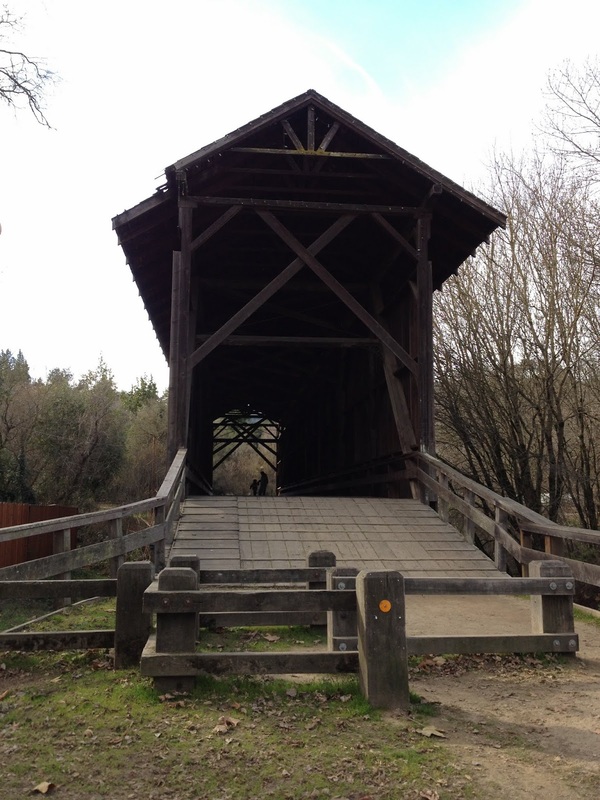 I ate that at the covered bridge park, then slowly made my way to Zayante and headed north. The trip up Zayante would have been uneventful, except that on a downhill immediately before the Zayante Market, I hit a bump. I heard an odd sound, but didn't notice until a few seconds later that my Garmin Forerunner 305 had bounced out of its plastic clip. I went back to retrieve it, and on this lonely, lightly traveled road I saw a car round the corner and snap the thing into pieces. What are the chances? That's the second 305 I've lost. The first popped out while I was descending the Quicksilver trail. I'm sure that computer survived, but I couldn't find it. This one was toast. Well, damn. As a fallback for recording ride information I turned on the MotionX application on my phone, which is pretty good but drains the battery too quickly to be used on long rides. Unfortunately MotionX can't display my heart rate, so my recent strategy for pacing myself was suddenly useless. I like to think I'm not overly dependent on gadgets or technology, but I immediately missed being able to see my heart rate and the altitude. Zayante climbs fairly steeply to the intersection with Eagle Tree Lane, where it turns into Upper Zayante Road and immediately drops a hundred feet or so. The rest of the climb averages just over 7%, but has lots of very steep sections, and seems relentless. Despite not being able to see my heart rate I apparently paced myself reasonably well, because I felt good all the way to the top. Maybe I'm not dependent on the technology after all. I was thinking about heading north to take Black Road down, but the day was running out so I cut the ride short by taking Bear Creek Road down to the Lexington area. 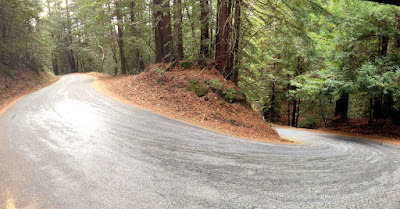 Bear Creek Road is a pretty fast descent, and I followed a car down to pace myself. The rest of the ride was uneventful, but I felt good enough to take Kennedy back toward home. Now, normally I look at the GPS track to learn a bit about the ride and produce an elevation profile, like the one below. I had data from the latter part of the ride courtesy of MotionX, but the first part was lost with the crushed 305. I was surprised to find that this worked: first, I drew a map on Google Maps, then downloaded it as a KMZ file. Then I ran that through the GPS Visualizer, which not only converted it to GPX (which was my only goal), but also was kind enough to add elevation data based on USGS and/or NASA data. Well, that's a bonus, and was enough to produce the profile below. I didn't have my timing or heart rate data, but I don't pay much attention to that retrospectively anyway. According to the reconstructed data, it looks like the ride was about 53 miles with 3800 feet of climbing. The lost computer was a bummer, but the ride certainly met my wish to be among the lush trees for a few hours. Over Christmas I visited Phoenix. For my gift this year, my wife arranged for me to rent a bike for the trip. On Christmas Eve -- a little early, now that I think about it -- I went for a ride. 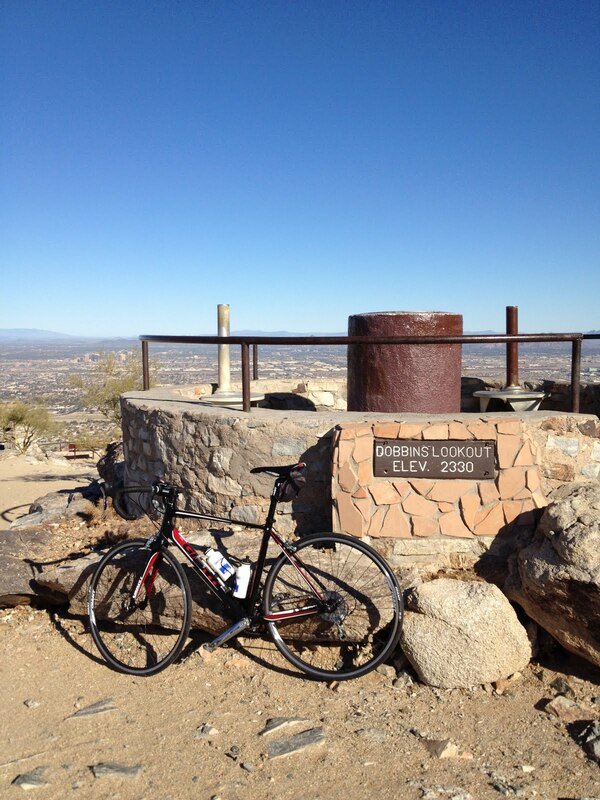 We got the bike, a Giant Defy 2, at Arizona Outback Adventures. One of the thoughts behind the gift was that I could try out a Madone or some other better-quality bike, but in the event that didn't seem particularly motivating. The Defy 2 is cheap and serviceable. Actually my only complaint was that I completely forgot to check the horizontal size of the bike, and therefore got one that was at least 5 cm too short. Good enough for one day, though. The family was getting together in the late afternoon, so I had to get going early. I rolled away at 8:15 and made my way from Scottsdale down to Tempe, along the so-called Greenbelt path. The Greenbelt is a drainage system that takes the form of a string of parks, emptying into the Salt River. Throughout the system there's a bike path, with no streetlights to wait for and few roads to cross. On Christmas Eve, there weren't even many pedestrians. I made good time to the river, then followed it west to a bridge across the riverbed and into Tempe. I went south on Hardy so I would pass by my first apartment at school. I must say, it brought back zero memories. It was the right place, but hardly looked familiar at all. 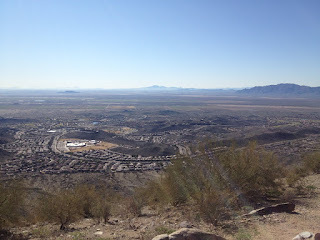 I took Hardy to Baseline, then Baseline west to Central, and finally Central south into South Mountain Park. When I lived here 20 years ago I rode up South Mountain a few times, but my memories of the climb were dim. As it turns out, it's long but not at all steep.There's no shade, which wasn't a problem on this cool day. The road winds up the northern face of the range, and since there are no trees you get unbroken views of the hill and the valley beyond. 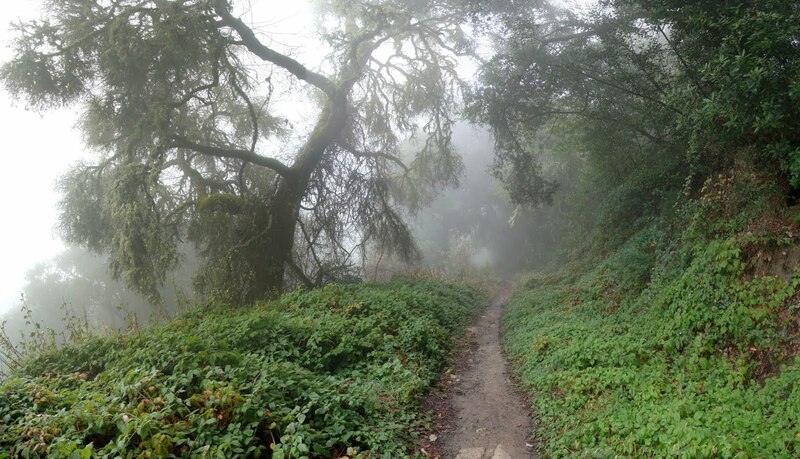 The bulk of the climb is a 2.6 mile section that rises from about 1550 feet to 2250, for an average of 4.8%. At that point it levels out for a while, then climbs another 100 feet to the first stop: the summit. The summit area has a parking lot and a lovely view of almost the whole valley, from Avondale on the west to the eastern edge of Scottsdale. As the sign says, this area sits at about 2300 feet, perhaps 1100 feet above the valley floor. After taking a few pictures, I went back down and followed the signs for the TV Towers. This brings you around to the southern face of the range, and to its highest point (as far as I know). When I rode this in the 80s, I seem to remember that this road went past the towers, then just ended at a gate. Now it runs up to another parking lot, this one with views to the south and east, at 2600 feet. I'm pretty sure it wasn't here before. Here, at the high point of the ride, I stopped to eat a bit and enjoy the view. The last time I was up here I remember seeing construction to the south of the mountain and not knowing what it was. Well, now I know, but all the growth in this view -- Gilbert, Chandler, Ahwatukee -- is nonetheless a mystery to me. In multiple ways. Refueled, it was time to descend. The road is in great shape. It twists a bit, but you can see along the road for miles since there are no trees. In other words, it's a great road to descend. I made good time, despite having to wait for a bit before I could pass a van. I didn't have any other destinations in mind, so once I got on Central I just kept heading north. I ended up riding straight through the heart of Phoenix, which wasn't busy on this holiday. Central has a sporadic bike lane, but in any case traffic was light. 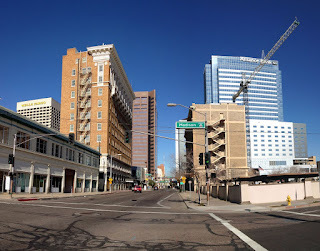 My trip through town was pleasant but not especially memorable, which I guess one could say about Phoenix as a whole. I followed Central to Glendale, then took a right toward Scottsdale. Glendale turns into Lincoln and goes by Squaw Peak (yeah, I know) and Granada Park, where I occasionally used to participate in the Sunday Morning Breakfast Ride. We would get up insanely early, wake up some friends, ride like crazy for a few miles, eat a big breakfast, then ride some more. Apparently that's still happening, which is great to know. The remainder of the ride was an uneventful and straight shot back to Scottsdale. In the end it was just slightly over 63 miles, so I met my goal of 100 km. There was about 2100 feet of climbing, which isn't much for a ride of that length. It was great to see South Mountain again, and although I don't remember my long-ago rides well enough to compare, I was happy with my ability to climb it. In all, the rental thing worked out well, and it may become a regular part of these sorts of family visits. In my continuing effort to explore the hills east of the valley while the Santa Cruz mountains are overrun by Christmas tree hunters, today I rode my bike up Mount Hamilton. I rode up Mount Hamilton a couple of months ago, so to change things up a little I started from home. All previous times I've climbed the mountain I've parked on Alum Rock Avenue, so this was a twist for me. But last week's ride was similar, so I was inspired. The weather so far this winter has been remarkably consistent: no rain, about 35 F in the morning, and a high in the low 60s. It was that way today, too. As has been my habit recently, I dawdled until about 9 AM to avoid the really cold air, then set off. The ride through town was entirely uneventful. 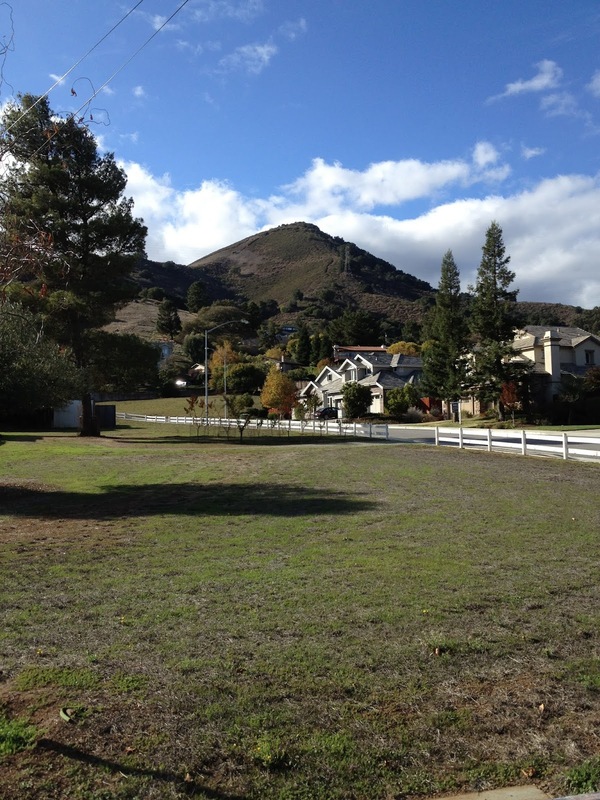 I took the Highway 87 trail up toward downtown, then took various minor roads until I got to Santa Clara, which later turns into Alum Rock. For the first time, my climb up Mount Hamilton started at about 200 feet on Alum Rock, rather than 400 feet at the intersection. Compare this to the same view in March. This is probably the right season to be riding in the Diablo range. It's nice and cool, so the lack of shade is actually welcome. The only problem is that it's awfully brown; there has been no meaningful rain for six months now, and everything is dry, dormant and unrelentingly beige. Somewhere on this second climb I managed to get a flat. Not trusting my patching abilities, I always carry a spare tube. In this case the spare had a hole in it, so I patched the original tube. It held air the rest of the ride, so I guess that was a success. As for the bum spare, I'm guessing I damaged it at some point when jamming the tube, some levers and patch kit into the tiny bag under my seat. Other than that, not much drama on the way up. I was watching my heart rate, so I made steady but slow progress. Actually, it was awfully slow. Even considering the leisurely tire repair, it was much slower than my last trip up, when I was ignoring my heart rate and consequently running 10-15 bpm higher. Once at the top I filled my bottles, bought some potentially ancient peanut M&Ms, and walked around a while snapping pictures. The views toward the east were good, but the valley was very hazy. As usual, the summit was windy and quite cold, so I put back on all the clothing bits I had removed on the way up. Looking southwest from Mount Hamilton. I rolled over to Mount Copernicus, to see if I could get any decent shots to the east, but not much luck. So I turned and headed down. Just before I got to the Lick Observatory, an SUV pulled out and headed down. I used that SUV to pace my trip down. I could have passed it, but having it in front of me meant that I could take the lane with confidence, and it wasn't slowing me up too much. I enjoyed the decent more than I usually do. 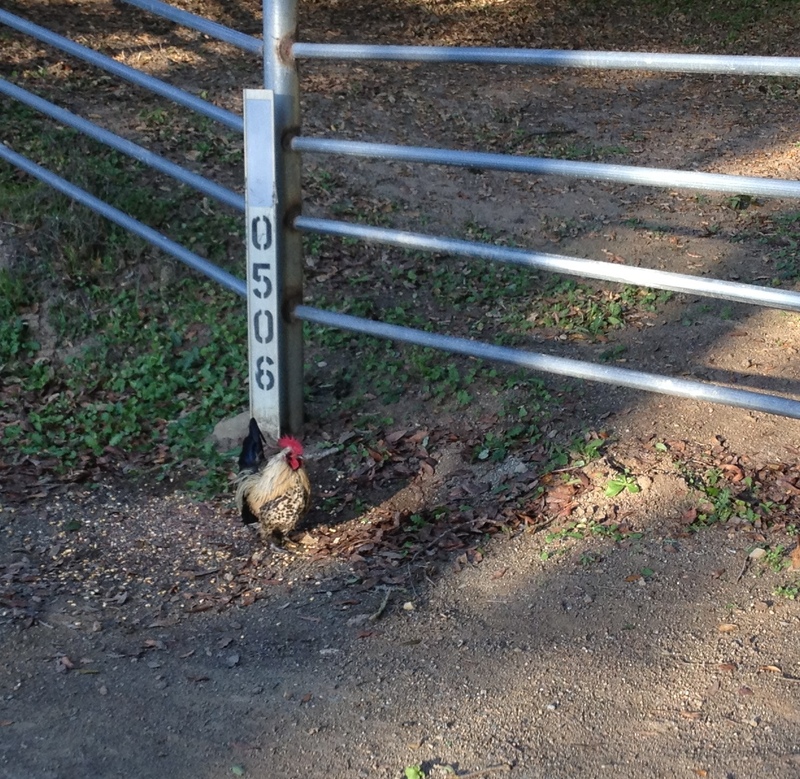 When I got to Grant Ranch I decided to take advantage of the fact that I didn't have to get back to my car. I heading back over Quimby, rather retracing my steps. This east side of Quimby climbs about 600 feet at over 8%, so it's a hike but much easier than the cruel west side. After a long and fast decent down Quimby, I defaulted to the Capitol Expressway for the trip home. If I'm going to be doing this sort of ride with any regularity I need to find better options. Capitol Expressway has a bike lane, but it's busy and crossing highways is nasty. I got home shortly before sunset. It was nearly 63 miles, with something like 5600 feet of climbing. Not nearly as long as last week, but more climbing. I definitely prefer riding from home, so this was empowering for me, and lots of fun. In the interest of avoiding Christmas tree choppers in the Santa Cruz mountains, this week I decided to explore some new territory for me. 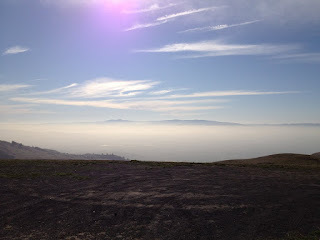 Specifically, I wanted to see what was on top of Sierra Road. I'm not especially interested in checking off the major climbs in the area, in the sense that I record "personal best" times or such things. But I'm certainly interested in exploring new roads, so it amounts to the same thing, but at a relaxed pace. In this case, I've seen these hills for years, and was looking forward to seeing what was on the other side of them. 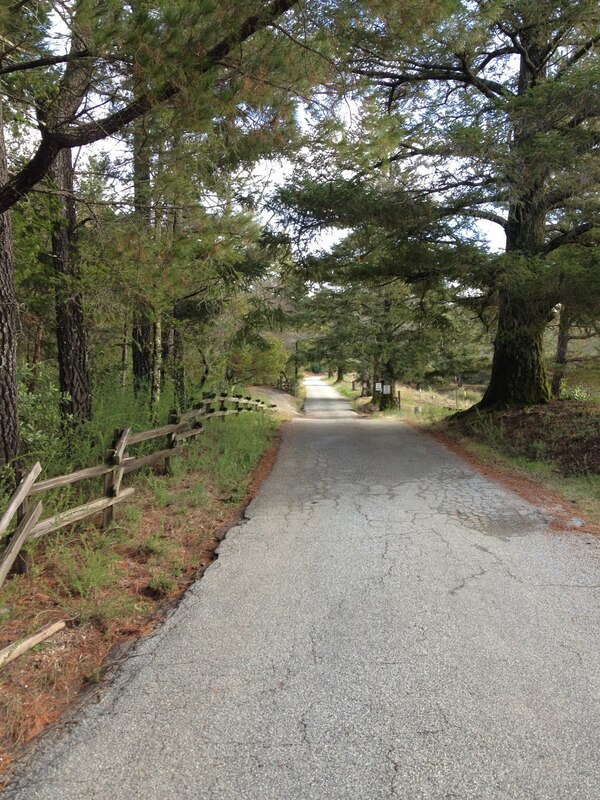 For me, as a casual fan of bike racing, Sierra Road is most notable as the site of Chris Horner's amazing attack on stage 4 of the 2011 Tour of California. 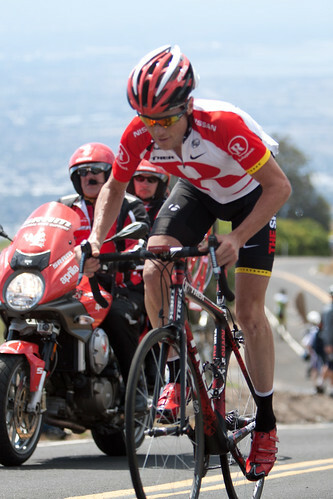 After climbing up the backside of Mount Hamilton as a warm-up, Horner had an amazing ride up this difficult road, and essentially won the tour with that effort. My ride would look a little different. I started out at about 9:30, bundled up a bit against the sub-40 degree temperature. I headed toward the east valley on Blossom Hill. Blossom Hill crosses all the north/south highways, then climbs up a little hill before it drops into the east valley. Maybe not such a little hill -- although it only climbs a few hundred feet, there's a half-mile stretch with a grade over 11%. I don't know how steep the other side is, but my speedometer was north of 40 mph as I was heading down. A good warm-up, I suppose. 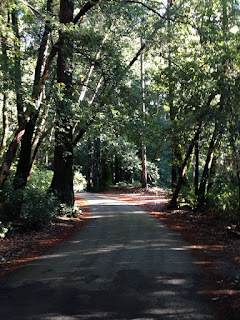 After a few miles on unremarkable suburban roads, I finally reached Sierra Road and turned east, toward the hills. The first ramp is immediately in your face, and so preposterously steep that I laughed out loud. I took a picture and deep breath, and headed up. Like all these eastern hills, there's very little tree cover. That was actually welcome on this mid-December day, but on a hot summer day I'd be boiling on this climb. The road heads straight up the hill through a residential neighborhood, then takes a sharp left turn and begins winding through increasingly sparsely populated hills. 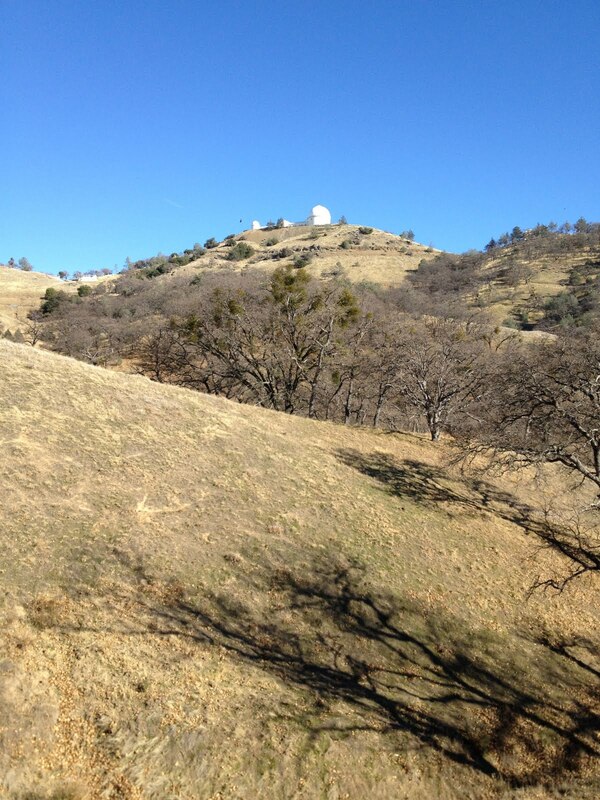 The data I collected told me that the main climb -- from the bottom to the first peak -- was about 3.6 miles at 9.5%. It was steep everywhere, with some especially tough ramps. If I remember correctly, the only streches with an even moderate grade were very near the top. Looking south from Sierra Road. Sierra Road is famous for its views, but yesterday there was a haze over the valley that, looking into the sun, made it look like a thick layer of fog. After reaching about 2000 feet, the road undulates at that level around the east side of the hill. 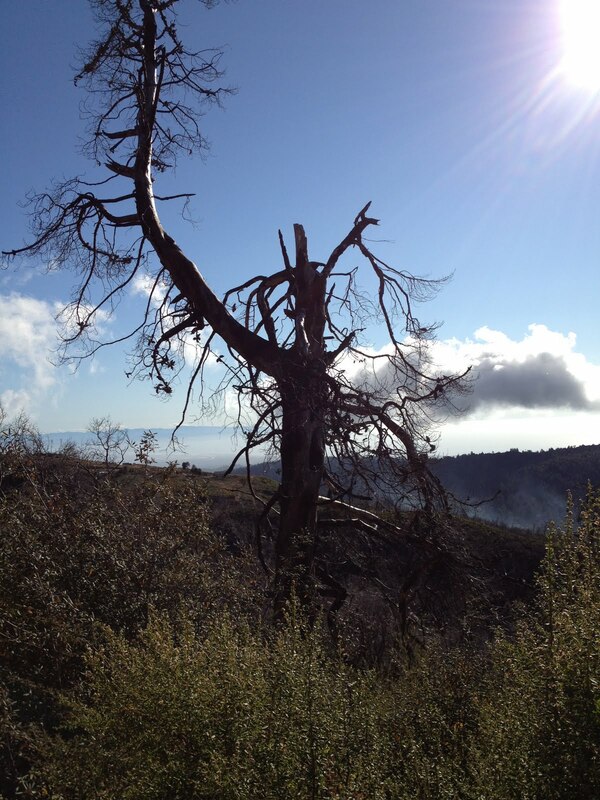 The views of the valley give way to views of Mount Hamilton and the rest of the Diablo range. 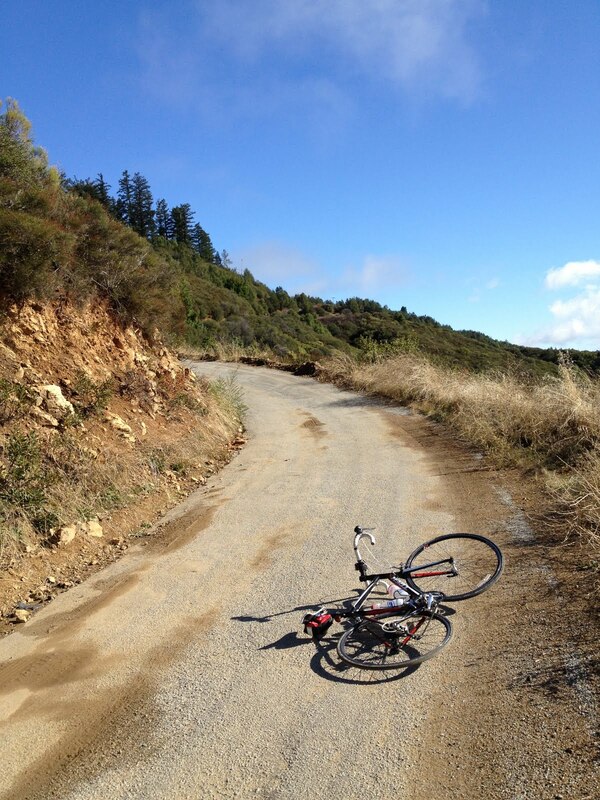 After Sierra Road turns into Felter it starts dropping. 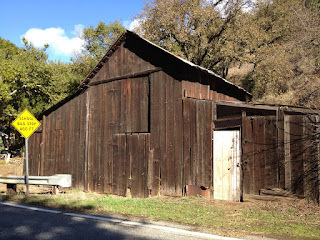 At the intersection of Felter and Calaveras, I stopped to plan a bit. I was about 30 miles into the ride. The road to the left led back into the valley, and practically speaking would mean that I would just head home. 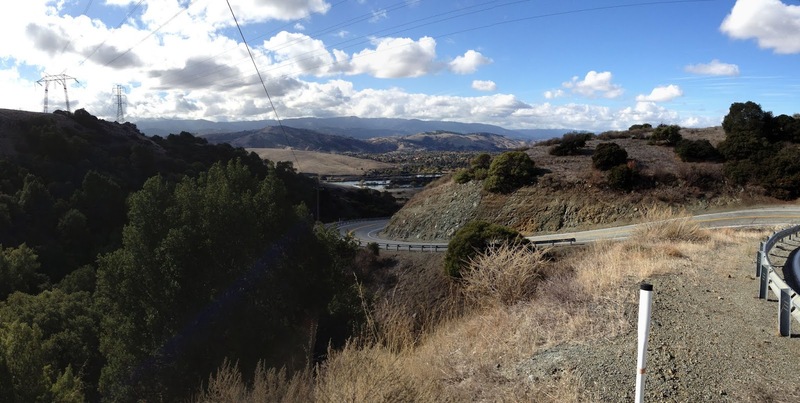 To the right, the road led to the Calaveras Reservoir, then north for a few miles before crossing into Felton. In all, it would add another 25 miles to the ride. The road toward Calaveras Reservoir headed up a bit, and I thought I'd see what could be seen from the top of that hill, but then turn around and return through town. First, that little hill was a lot steeper than I expected -- about 10%, if only a quarter-mile long. Second, once I got to the top I didn't turn around. Seeing these (relatively) remote roads is the whole reason I came up here, after all. It was definitely the right choice. 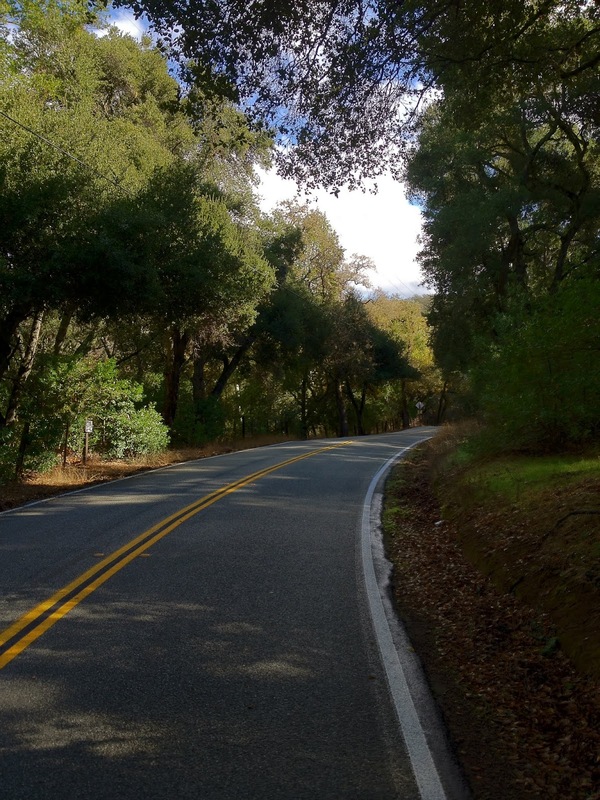 Calaveras Road shrinks to a single lane and winds along the hill above the reservoir. It's quiet and wooded, and on this day a little chilly. There were a few bike riders, a couple of cars, and otherwise I had the whole road to myself. After the dam the road drops down into a broadening valley floor, then heads mostly north toward 680. At that point the road turns into Paloma Way and turns west. 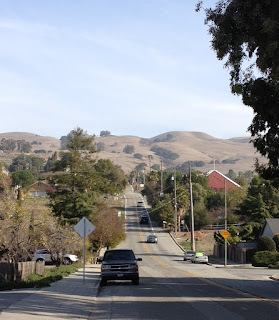 Shortly afterward it heads into something called Niles Canyon, which manages to cross the mountain range without gaining any altitude at all. 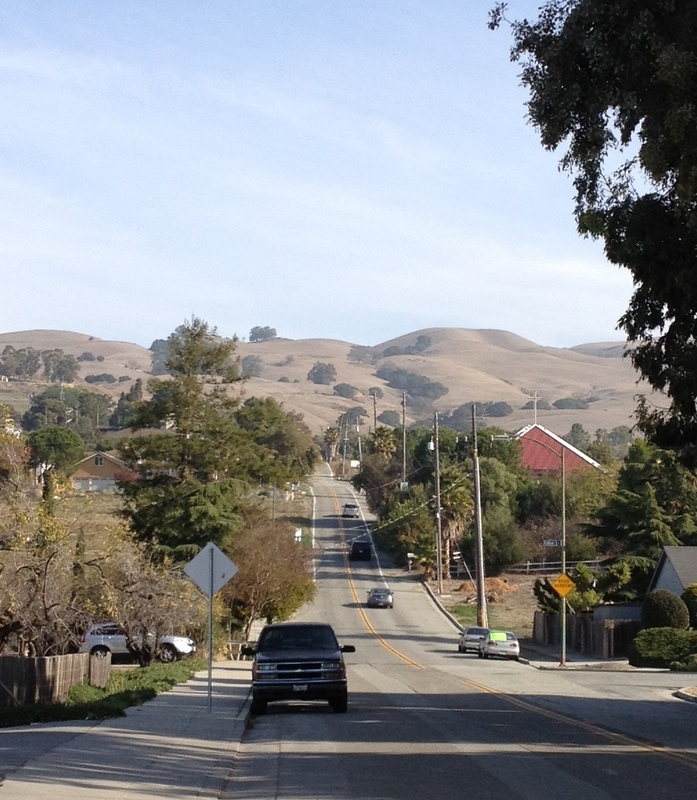 It's a very pretty road, running next to Alameda Creek and a railroad line, then surrounded by towering hills. Unfortunately it's also a two lane road with no shoulder and a lot of traffic, so it's hard to enjoy the sights (let alone snap a picture). The canyon exits into Fremont. At this point it was about 2:30 in the afternoon, so I was about 30 miles from home with perhaps two and a half hours of daylight remaining. It looked OK, but I didn't have time to look for picturesque routes home. So I hopped on Mission Boulevard, a large road that at least had a bike lane, and headed south. 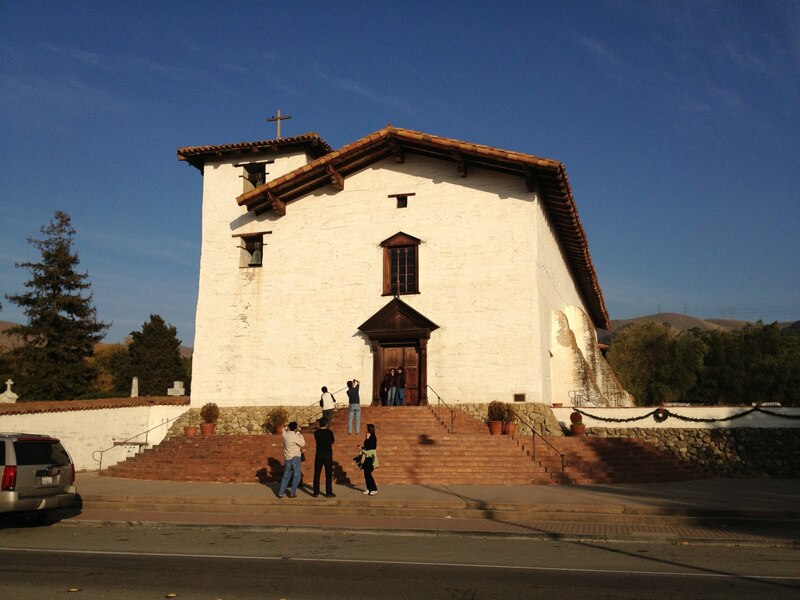 After crossing 680 again, Mission Boulevard quite appropriately passes by the Mission San Jose. I would have loved to look around a bit, but as I was pressed for time I settled for a few pictures. After that it was just a series of suburban roads, mostly with bike lanes, and crossing 680 two or three more times. I ended up getting home shortly after the sun set, just a little late. See a note about data for details. In all it was just short of 83 miles. 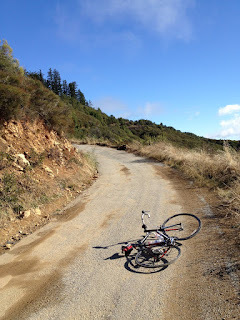 There was only 3600 feet of climbing, but it seems like all of it was very steep. That's a long ride for me, but a very pleasant one. I'm glad I had the chance to see what was up there. Yesterday I took advantage of a lovely winter's day in the bay area to take a bike ride through the Santa Cruz Mountains. When I got up in the morning, the thermometer was reading about 35 F, so it took a while to get motivated. I told myself I was waiting for it to heat up a little. I ended up setting off at just about 10 AM, when the temperature was still low but the sun felt great. I took the usual route through Los Gatos and up the Leniham Dam. I wanted to climb up Black Road to Skyline, so I took the dirt path next to Highway 17 to the Bear Creek Road overpass, then went over to Black Road and started climbing. Well, almost; first, I waited behind a traffic jam of 4-5 cars stopped just after the turn. I mentioned that last week I saw a lot of traffic going to the area's many Christmas tree farms, but this week was much worse. Black Road itself has several tree farms, and leads to others on Skyline. There was more traffic on tiny Black Road than there was on Blossom Hill or Skyline. And worse yet, it's almost all trucks and SUVs. The lower part of Black Road climbs at about 9%, which is manageable but uncomfortable in traffic, given my tendency to weave a bit. You would weave too, if you climbed as slowly as I do. I was thinking that this would make a great opportunity to try Gist Road, which is reputedly tiny but carries only local residential traffic. I gave that up when I passed the road and a sign indicated four Christmas tree farms ahead on Black, and another four on Gist. That's literally a bad sign. As if to emphasize the point, there was a truck exiting Gist as I passed. As bad as traffic on Black was, traffic on a skinny road like Gist would likely be worse, so I stayed on Black. Black Road levels off for a mile or so, then resumes climbing. After I passed another two tree farms, the traffic thinned out significantly, and I could relax a little and enjoy the sights. At Skyline I took a right, heading north, which meant I just kept on climbing. Eventually I got near the peak just short of 3200 feet. The map says this is something called McPherson Peak. 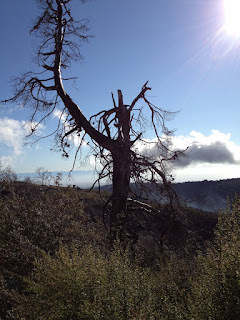 Near the top were breathtaking views toward the south and west, across layered mountain ranges all the way to Monterey. Up on the ridge the air was naturally much cooler, and it was largely shaded. I bundled up and descended down toward Saratoga Gap, where I passed up a chance to buy a soda and continued north on Skyline. At this point my plan was to head up to Page Mill Road, then take that down to Foothills and have a long flat ride home. But as I was riding along, seeing Black Mountain on my right, I thought that it might be fun to ride that way, reversing an earlier ride up Montebello. On Page Mill I turned right. I've read that Page Mill Road retains scars from its crossing of the San Andreas fault, but while I was on the lookout for signs of shifting or sagging, I didn't notice anything. Maybe next time. I picked up water along the road. 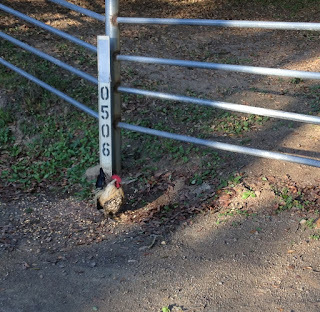 The entrance to the Montebello trail is gated and largely unmarked. The only reason I recognized it was from a previous ride. Signs at the entrance indicate authorized vehicles only, but there are no similar signs coming from the other direction, and the map indicates that the trail is open all the way to the road. So is MROSD teaching me to ignore these signs or not? Approaching Black Mountain from the north is steep. The first section is a paved driveway, and steep. After that is a steep dirt trail. Apart from the grade it's a fine trail for a road bike, and I think about half of the bikes I saw on the trail were road bikes. At the top is a nest of antennae and a few surrounding trails. The last time I was up here was the Fourth of July. It was very hot, and I didn't spend much time looking around. 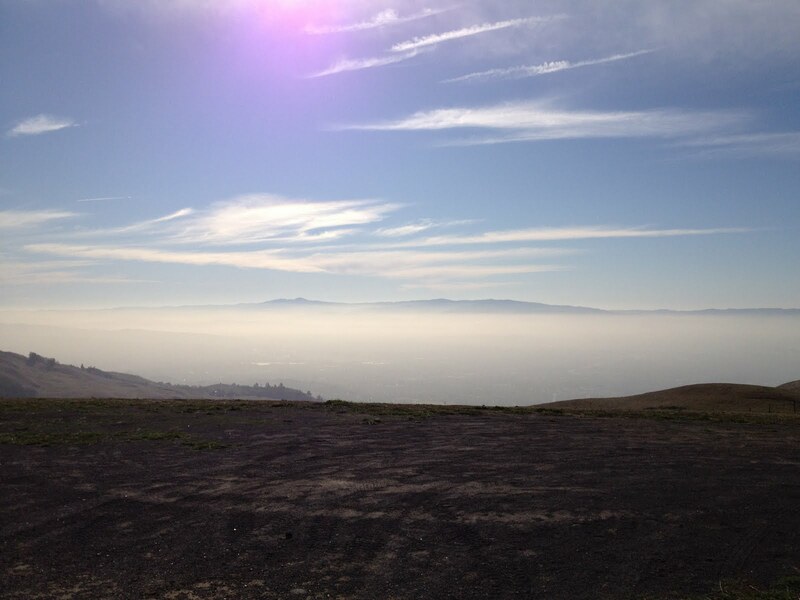 This time I searched around a bit, looking for a nice clear view of the Santa Clara valley. In person, and especially on a clear day like yesterday, the view is spectacular. It's a little hard to convey in a photograph because trees are in the way. In person you just move a little. Having drunk in the scenery, I headed off for the long descent. After a little more dirt trail, Montebello Road appears, along with a more accessible view of the valley. 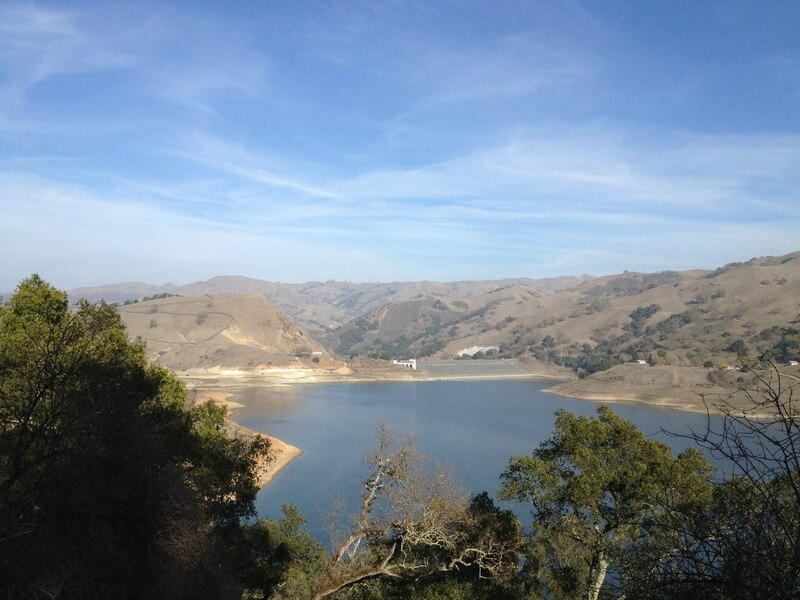 After I took a few pictures, I dropped down the mountain to the Stevens Creek Reservoir. Normally I would have turned right toward Saratoga and then home, but I've done that a lot lately and was looking for something different. Shortly after I moved here, while still living in temporary housing in Cupertino, I came up here on my very first bike ride in the area. I retraced those steps back to McClellan, near my old apartment, then headed across town toward Almaden Valley. In doing that, I was retracing part of my second ride in the area, although before too long I got off track. Riding in suburban sprawl doesn't invoke much nostalgia. In the end it was just over 57 miles, with a little under 4000 feet of climbing, and another day among the trees on quiet mountain roads. Although sometimes the trees were bundled up on top of cars. Nothing's perfect.